Enter your name as you would like it to appear on your addition facts timed test report card. 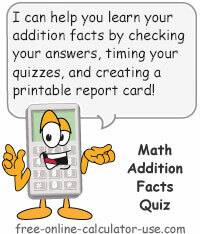 Select the math fact (addend) you would like to practice in this session's quizzes. This field will display the number of correct answers as you make your way through each timed addition test. This field will display the number of seconds that have passed since you answered (tabbed out of) the first addition and will stop once you tab out of the last question, or when seconds reach the maximum of 240 seconds (4 minutes). For each addition, enter the answer (numbers only) and then press the "tab" (right arrow) key. Be sure to check your answer carefully as you cannot change an answer once you have tabbed out of the field. The timer will start as soon as you tab (right arrow) out of the first answer field and will stop when you tab out of the last answer field. Also note that you must complete each quiz to stop the timer (no starting over midway through). Each correct answer will turn the cell light green, whereas an incorrect answer will turn the cell light red. You have a maximum of 4 minutes (240 seconds) to complete the quiz. If you would like to save the current entries and results to the device you are using, tap or click on the Data tab and then tap or click on the Save button. If you upgrade your Basic, Local Storage subscription to the Cloud Storage acess level, you can save multiple sets of entries for this calculator to the secure online database, which makes them accessable from any device. The field displays the number of quiz scores stored for the selected fact. If you would like to start a new session for the current selected fact, click the Reset Session button. IMPORTANT: If you want to keep a record of your current session with the selected fact, be sure to print your report card first. This timed test was actually created to assist my own children with learning addition facts and to give myself an easy way to track their progress. The quiz not only times and grades the addition drills, but it also provides you with a printable report card for tracking and measuring progress made during each addition facts practice session. The report card stores up to ten quiz sessions, complete with stats, a cumulative wrong-answers table, and a bar graph that combines the time it took to complete each quiz with the percentage of wrong answers. After all, the measure of success in learning addition facts is not only in the ability to answer the additions correctly, but also in the time it takes to come up with the correct answers. If you have a child (student) that is struggling with learning addition facts, then I suggest you have the child start with 2's and have them take 5-10 timed tests per day until they are able to consistently complete each test in less than 90 seconds -- with no wrong answers. At that point they can then move on to 3's, and so on until they have memorized all math facts for the addends 0-12. I also suggest you have your child (student) print out the report card for each addition facts practice session, which will help them and you to track their progress, and to provide you with proof that they are completing their "homework assignments." Once the child has finished mastering math facts for addition, you can then guide them to the Multiplication Quiz for mastering math facts for multiplication. Enter the name you would like to appear on the report card. Select the fact number you would like to be quizzed on. Scroll down and tap in the first answer field (light orange background). Enter the answer for the first addition and then tab (arrow right) to the next field. This will start the timer and the correct answer tracker. Repeat entering the answer and tabbing to next field until all fields have been answered and tabbed out of. After each quiz you can view and print the session report card. Tap the "Reset Quiz" button to repeat the quiz for the same fact. Tap the "Reset Session" button or choose a new fact to start a new session (be sure to print the report card before reseting the session).